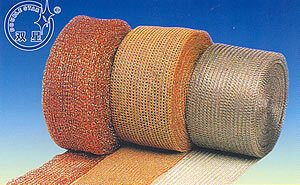 The table shows a wide range of Knitted Wire Mesh whose characteristics meet the most frequent use applications. A:It is the standard width of mesh going out of thema chine, once flattened(flattened pipe). B:It is the maximum width the macine can deliver. C:It is the minmum width the machine can deliver. F:Mesh opening. Also included in the nominal width. Two mesh openings machines. The first opening is that between two needles. The second is that of the hole of the needle itself,i,e., there is one opening of each alternatively. G:Weight of 1 linear m of flat mesh, in grammes, 0.26mm wire, AISL 304, mesh at rest not drawn, if the wire diame ter is differ ent the weight of mest is proportional tk the wire section(*).Make the conversion according to the spectific weight of each material for the different qualities. (*) Section in the sense of the area.